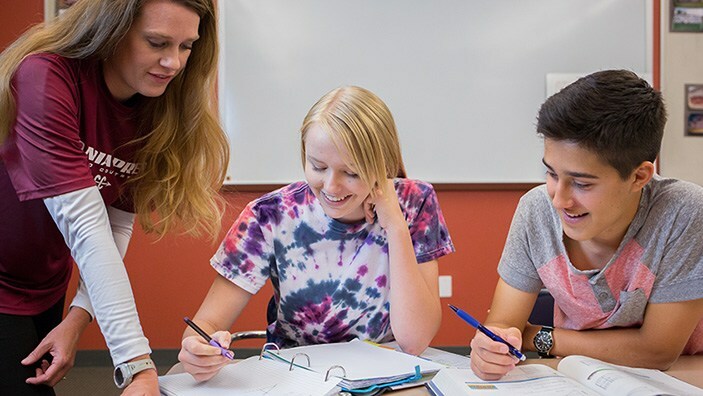 Throughout our Upper School honors-level courses, higher level cognitive skills are developed with a curriculum that emphasizes design-thinking and innovation. As with Homer's Odysseus, our Odyssey Scholars set out on an epic journey of learning and discovery developed around an area of study which they are passionate about. Odyssey Scholars will challenge themselves academically, intellectually, and creatively by designing a two-year course of study that will culminate in a major public presentation. This program combines the elements of Independent Study, Senior Experience, and research (capstone) projects. Students may apply for the program at the end of Sophomore year. Meet our Odyssey Scholars and visit their blogs to learn more about their journeys. Distinguished Scholars are students who have chosen to take additional classes during their time at Sandia Prep while maintaining a 3.5 GPA. These students graduate with 28+ credits. While some may focus specifically in a given area (math, science, arts, etc.) others may have branched out and accumulated the credits in a variety of areas. Sandia Prep's Engineering & Coding classes begin in the 8th grade and continue through senior year. Students build on a foundation of engineering concepts and basic coding taught in 8th grade and progress to Mechatronics and longer, more complex strings of code. Learn more about Sandia Prep's engineering and coding classes. Exciting News! Sandia Prep was recently awarded a $25,000 grant for our Engineering & Coding Program. The grant will be used to cover equipment for our engineering and manufacturing lab, including a laser cutter, a 3D printer, robotics kits, and various tools. Thank you to The Slomo and Cindy Silvian Foundation, Inc. for believing and supporting Sandia Prep's vision. View our 2018-2019 Curriculum Guide by clicking the cover above. Senior Capstone is required of all seniors providing them with the opportunity to design an independent research project for their senior year. Academic research, internships, observation and interviews, and public presentations are aspects of every project, however, the final product can be anything from a formal paper to an artistic endeavor. Seniors develop the project throughout the year, and all seniors will have a 3-week period of time in late April and May during which they will be released from classes to finalize their projects and presentations. A typical class load is 5 core courses with 2 additional elective courses totaling 7 classes, with 1 free period. While the school makes no guarantee that additional classes may be scheduled, exceptions may be made. A 2.00 grade point average (GPA) is the cutoff grade for promotion. A student must have a 2.00 GPA at the end of each marking period and a cumulative 2.00 at the end of each school year to be asked to continue. For the 2017 -18 school year, students entering 12th grade must have 23 high school credits and a cumulative GPA of at least 2.00 to graduate. Students entering grades 9-11 must have 23.5 high school credits and a cumulative GPA of at least 2.00 to graduate. View details regarding required classes and electives. Rigorous courses and college counseling beginning in 9th grade translates to 100% of our seniors being accepted to four-year colleges.